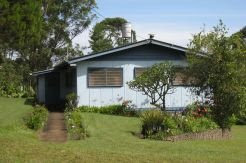 Ok, just to make sure that everyone is on the same page now, I’ve posted some photos of the house that we are renting in Ukarumpa. We are no longer living in a bush house in the village. Some of you might be a little disappointed to see that we aren’t “roughing it” as much as you thought we were. But people! This is 2009. Even in the middle of Papua New Guinea we can still have creature comforts. If it makes you feel any better, the house was built in 1972 and the interior still is decorated mostly in that style. Very retro-cool, or so we tell ourselves. This house is owned by a family who is at home on furlough right now. We get to stay here until they come home, at which point we’ll be moved to whichever house is empty at the time. The beautiful yard is courtesy of a husband and wife team of Papua New Guineans that we have hired to mow the lawn and take care of the garden. The majority of families here will hire helpers for their lawns or homes. It’s a great way to support the local economy. Besides, they do a much better job than I could. Thanks for the update. It's nice to see you have "normal foods" to eat. 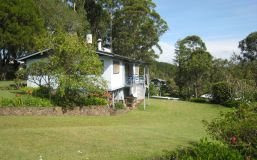 I'm sure the "retro" house reminds you of home as our house was built in 1972 also. Post some inside pictures when you get time. Gma and Gpa S want to leave a message, so I'm helping them. They like the pictures and are glad you are doing well.